Believe it or not, I forgot it was almost Christmas. It wasn’t until I stepped inside (you guessed it) Fred Meyer that it all came rushing back to me. Don’t get me wrong: I have nothing against Christmas or those who celebrate it. Nothing at all. I know it seems bizarre to my Christian friends that I don’t celebrate Christmas or even understand a lot of the traditions. There are certain aisles in the grocery store that I never visit: those with whole categories of things that I just don’t use, and never buy. Air freshener and cosmetics are examples; those displays are just background noise and I walk by without taking much notice. The Christmas stuff is kind of like that for me. Does that seem weird? Anyway, having both kids home for a while is wonderful and it means lots of cooking and baking. I made some old favorites over the weekend; they are not as hard as they look. On the schedule for this week is rugalach: tender cream cheese dough rolled around a raisin and walnut filling and covered with cinnamon and sugar. I make mounds of them every year and needed a couple of things to get started. I am determined to reach my goal of 100 gifts before the end of the year. It’s going to be a crunch because I still have nine or ten to go. I had my eyes out while shopping but mostly I was concentrating on getting what I needed and back home. I had parked right out in front of Starbucks and on the way to my car I noticed a woman sitting by herself behind the window. She had her laptop in front of her and looked pretty engrossed. As I walked by, she looked up and our eyes met briefly. I loaded my groceries into the trunk and decided to go back and talk with the woman. She was tucked all the way in the back, where there was some kind of toy collection. There was no one sitting nearby. It was perfect. I went in and breezed right by the counter as the barista followed me with his eyes. “Hi there,” I said, as I walked up to the woman’s table. “Hello, she replied.” She was friendly but a bit wary. “Oh, you don’t have to give me a gift!” she protested. “Are you kidding me? Are you kidding me? Is this for real?” I reassured her that it was legit but she remained incredulous. “Are you kidding me?” she said a few more times. 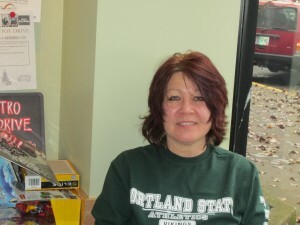 We talked about the layaway angels and how an act of kindness can have unexpected consequences. She agreed that her friend probably had no idea how much he had done for her. “Really, you made my year!” she said again. Then she gave me a hug. you’ve made my year too. I look forward to every entry, every story, and every uplifted heart that you’ve created. I was thrust into Christmas because I fell in love with, and married someone who isn’t Jewish. We’ve been married for 22 years, but we never bothered with it until we had kids. Now, we have 5 menorahs on the mantle (one for each family member), and a christmas tree by the window. It’s crazy and I often find that I miss the simple holidays of my youth. But the kids are still young, and it’s fun. I sure don’t look forward to tearing it all down and putting it away. Enjoy the simple celebration with your family! Thank you, Renee. Having readers like you is just the most wonderful! Enjoy your new family traditions; sounds like your kids will have great memories. Hi – I saw the article on the back page of our alumnae magazine and am visiting your website for the first time today. I graduated college in 1972. When I was at college, someone named “Doc” was giving away money. He turned out to be a kind of visionary – just a memory you evoked from college. I never was in the quad at the right time to get any of Doc’s money. I like your blog, and I love the picture of the big “black and white” cookies. I used to ogle them at the bakery all the time as a kid. Had at least one, but not many. So many sweets, so little time! I guess in the long run I didn’t really want to waste my time with the vanilla half. Chocolate all the way for me! (dark chocolate now) Haven’t seen them in a long time, living in Texas. Happy holidays! Thanks for stopping by and for your comment! Best wishes for the coming year. 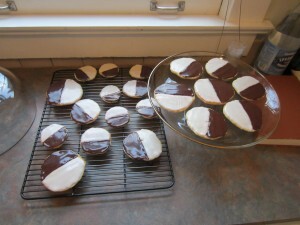 Maybe 2012 will be the year that black and white cookies appear in Texas!